Vitamin D is a fat-soluble organic nutrient divided into five analogues, the two most important of which are D2 and D3. Vitamin D mentioned without the subscript usually means D2, D3, or a combination of both. Some analogues of vitamin D are produced by the skin of all vertebrates as a result to the exposure of sunlight or other forms of ultraviolet B radiation. Vitamin D is also found in a variety of popular foods, and many countries fortify their milk with it. 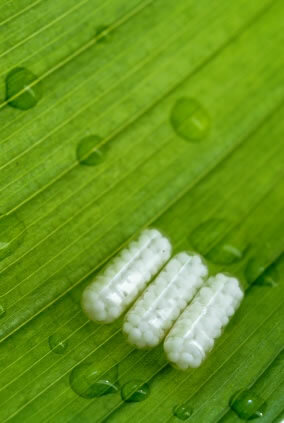 It is also available in pill or capsule form as a dietary supplement. Vitamin D is absorbed into the bloodstream where the liver converts it into calcidiol, a type of prohormone. Calcidol, in turn, is then converted into calcitriol in the kidneys and by the immune system in the blood. Calcitriol is a form of vitamin D that is physiologically active and works as a hormone that regulates phosphate and calcium levels and is also responsible for bone health and bone growth. People who suffer from deficiency in vitamin D can develop fragile and malformed bones. They are also more prone to contracting rickets and osteoporosis. Since vitamin D was first discovered in 1932, five natural analogues, called vitamers, have been found to exist and four synthetic analogues have been synthetically created. As a group, vitamin D analogues are chemically classified as secosteroids, which are steroids with one broken bond. Vitamin D1 is a molecular compound of ergocalciferol (D2) with lumisterol in a 1:1 ratio. Vitamin D2 (ergocalciferol) was the first to be discovered in 1932. This form is produced by invertebrates, some plants, and fungi. Biological production of D2 is stimulated by ultraviolet light. Scientists are unsure how the vitamin works in invertebrates, but it is thought to act as a natural sunscreen. Vitamin D3 (cholecalciferol) is the form created in the skin by the reaction of 7-dehydrocholesterol with ultraviolet B radiation, present in sunlight with a UV index of 3 or more. When enough of the vitamin is created, excess amounts spontaneously degrade. Vitamin D4 is an analogue scientifically known as 22-dihydroergocalciferol. Vitamin D5 (sitocalciferol) is another analogue created from 7-dehydrositosterol. Calcipotriol is derived from calcitriol and is used as a treatment for psoriasis. It was first discovered during trials involving the use of vitamin D for treating osteoporosis. It is applied as a cream or ointment to the skin or scalp with very few side effects noted. Rarely, the use of calcipotriol causes hypercalcemia. Dihydrotachysterol (DHT) is a synthetic form of vitamin D that many consider superior to natural D2 and D3. It becomes active by the liver without needing to go through hydroxylation in the kidneys. DHT has a two-hour onset time and is more efficient in the mineralization of bone salts. Paricalcitol is also derived from calcitriol. It is used to treat and prevent secondary hyperparathyroidism that is caused by kidney failure. Paricalcitol is manufactured and marketed by the drug company Abbott under the brand name Zemplar. Zemplar is administered intravenously and is associated with several side effects, including weakness, nausea, vomiting, constipation, and decreased libido. Tacalcitol is a derivative of vitamin D3. It is known to hinder keratinocytes in the skin and is used primarily as a treatment for psoriasis. It is most commonly sold under the brand names Curatoderm or Bonalfa. For most vertebrates, including humans, the primary source of vitamin D is that produced by their own skin. 7-dehydrocholesterol is produced in mass quantities by the skin of most every vertebrate, one exception being the naked mole rat. As ultraviolet B light (290 “ 315 nm wavelength)from the sun or other sources makes contact with the 7-dehydrocholesterol, it undergoes a photochemical reaction that converts it to cholecalciferol. In animals such as birds and furry mammals where their skin is blocked from the sunlight, 7-dehydrocholesterol is secreted into the feathers or fur in an oil, where it converts through sunlight and is eaten by the animals during oral grooming. The cholecalciferol then moves through the bloodstream where it is converted into calcitriol, the form that is usable biologically. UVB light does not penetrate glass windows. Sunscreen over SPF 8 totally inhibits vitamin D production, but experts say most people accidentally leave some areas of skin uncovered by sunscreen. A small patch left uncovered still produces active levels of vitamin D. Cloud cover reduces UVB rays by 50 percent. Shade blocks UVB rays by 60 percent. In the U.S. and other developed countries, most dietary vitamin D comes from artificially fortified foods. In the early 20th century, rickets was a major health problem. Since vitamin D combats rickets, the U.S. government began to artificially introduce vitamin D into milk. Results among the general population were almost immediate, and the program has continued to this day. Other countries have since followed suit. Other foods can also be fortified with vitamin D, including breakfast cereal, orange juice, margarine, and yogurt. Unlike milk, which is almost all fortified, other products may or may not be fortified. Mushrooms have recently begun to be fortified semi-naturally by exposing them to controlled UV light emissions greater than they would be exposed to naturally. 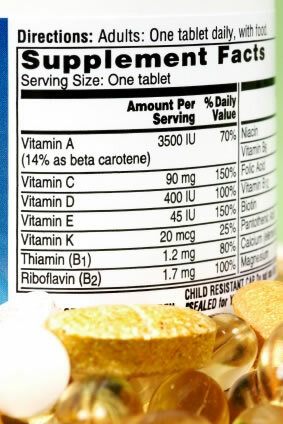 Dietary supplements are available as vitamin D2 or D3. D2 supplements are made by exposing yeast to UV radiation. This causes the yeast to naturally produce the vitamin. D3 supplements are made by exposing lanolin containing 7-dehydrocholesterol to UVB radiation. Although both work equally well as a treatment for rickets, some question has been recently been raised as to how they are metabolized. In tests, vitamin D3 shows to be as much as 3 times as effective as vitamin D2. Some people, such as vegetarians and vegans, are opposed to the D3 supplements, however, because they are sourced from animals. Although the exact serum concentrations of vitamin D for optimal health have not been established, researchers estimate the level is somewhere between 16 and 48 ng/ml and varies by age with older people requiring higher levels. Recently, however, one group of researchers have claimed support for their statements that the true optimum serum levels are 16 to 48 ng/ml, and supplementation of 400 IU per day only increase serum levels by 2.8 to 4.8 ng/ml. Therefore, they are recommending a daily value of 1,700 IU/day. Having sufficiently levels of vitamin D plays an important role in health and can prevent or treat several conditions. Although studies are still continuing, vitamin D shows an increase in ability of natural killer (NK) cells to fight infections. It also shows an increase in macrophage activity. Increased bodily production of cathelicidin, a natural antimicrobial agent, is also linked to sufficient levels of vitamin D. Some researchers have suggested that the immune system response to vitamin D can reduce the risk of fetuses to develop multiple sclerosis, but these claims are refuted by other researchers. A National Health and Nutrition Examination Survey once showed a link between low levels of vitamin D and peripheral artery disease. In addition, a study done in the U.K. showed that those who work outdoors in the summer had lower cholesterol. Others have claimed vitamin D deficiency is linked to high blood pressure. All of these claims were later shown to be untrue during systemic reviews. Cardiovascular studies with vitamin D continue and some recent findings have suggested benefits that are associated to particular ethnicities. In these studies, sufficient vitamin D levels in people of African descent may reduce the risk of cardiovascular disease, while no such correlation exists in people of European or Caucasian descent. Another study shows that Indians, despite receiving plenty of sunshine, may still suffer from vitamin D deficiency. Osteoporosis, which causes loss of bone density and increased risk of fractures, is usually associated with calcium deficiency, but studies show that vitamin D deficiency also plays a role in the development of the condition. Sufficient levels of vitamin D increase the body’s absorption of calcium and long-term deficiencies can manifest in osteoporosis. Vitamin D supplementation is recommended for seniors, individuals with limited mobility, and postmenopausal women to help prevent osteoporosis. Since most research of vitamin D and osteoporosis include calcium intake, the exact effects of vitamin D alone are impossible to determine at the present. Studies always recommend the two be taken together, and the final conclusion is that 700 -800 IU/day of vitamin D3 and 500 -1,200 mg/day of calcium reduces the bone loss and decreases incidents of falls and fractures for people between the ages of 62 and 85 years. Both human and animal studies suggest that sufficient vitamin D levels play an important role in the prevention of some forms of cancer, including breast cancer, prostate cancer, and colon cancer. So far, the presence of vitamin D shows the most promise in those with colon cancer, while the other forms of cancer have highly variable test results. Other studies of vitamin D and cancer show either no effect or even a negative effect. One study in Finland on smokers showed that the subjects in the top 20% of vitamin D serum levels are three times more likely to develop pancreatic cancer. The general consensus is that much more research is needed to determine the exact effects of vitamin D on cancerous cells. An independent group of researchers using the data from the National Health and Nutrition Examination Survey concluded that high levels of vitamin D indicate statistically lower rates of mortality among the general population. The research began with detecting vitamin D levels over a 6 year period, ending in 1994. The subjects, however, were continued to be tracked for mortality until 2000. By using the leukocyte telomere length (LTL) to predict the development of diseases and health conditions related to aging, it was determined that those with optimal levels of vitamin D would live longer. One group of researchers and concerned citizens known as the Vitamin D Council is claiming vitamin D deficiency is the source of a range of disorders, including autism, depression, and other forms of mental illness. While initial research shows some correlation, studies on these conditions have only just begun. Vitamin D has shown to interact with some medications. Corticosteroids, which are used to treat inflammation, impair vitamin D absorption. This can contribute to osteoporosis and a doctor should be consulted regarding vitamin D intake. Orlistat, a weight-loss drug, and cholestyramine, a drug to reduce cholesterol, also reduce vitamin D absorption. Phenobarbital and phenytoin, both used to treat epilepsy, increase metabolism of vitamin D into inactive substances. Vitamin D has also been shown to increase calcium levels in people suffering from lymphoma, sarcoidosis, and histoplasmosis. This can lead to kidney stones. Vitamin D may also contribute to more severe symptoms in people with atherosclerosis. 73 years old…take 5,000 IU…is this too much? Have no side effects listed.